This helps with choosing the best paint colors for your home. If you’re like me, you have a hard time visualizing how various colors will look in your home. I can look at all the paint samples I like as well as examples of rooms painted in various colors, but I still have a hard time visualizing how the colors will look in my home. An easy solution is using one of several free paint color visualizer software options available online. 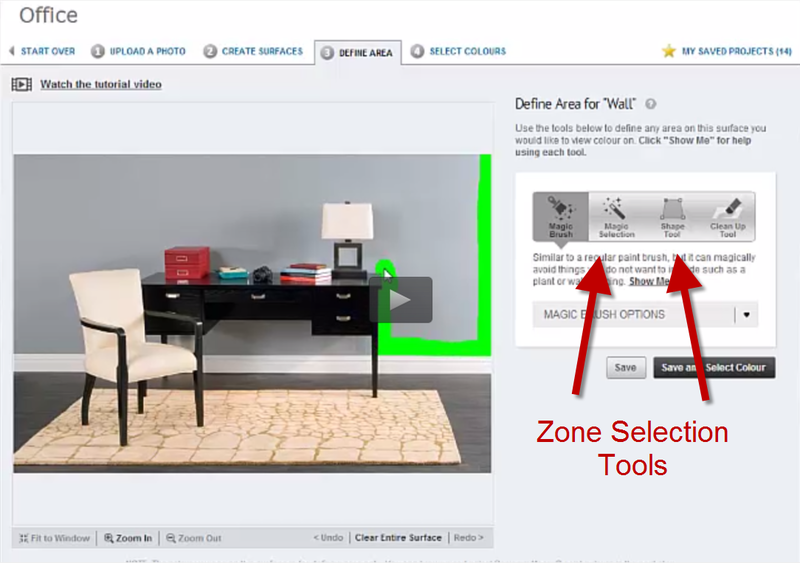 FYI – there are more than 5 online paint visualizer software options available, but we chose to list the best 5 options. We test over 12 and the list below includes our favorite 6. More importantly, each of the 6 below offers something unique and features we really like. To our benefit, several companies (mostly paint companies) offer free paint color interior design software on their websites to help you select paint colors for your home. Most of these software options offer a variety of features. Of course, they want you to buy their paint so the colors represent their paint colors. Therefore, if you have a preferred paint brand, it’s best to use that brand’s paint color tools. It’s easy to order the paint colors you decide on using the software. We’ve spent hours trying out several paint color matching software platforms to save you time. Below is our list with brief descriptions of what the software offers. We’re pleased to offer free online paint visualizer software here. With this software you can upload interior and exterior photos of your home and then apply hundreds of different actual paint colors from the Behr paint collection. It’s entirely free and all online (nothing to download). It’s super easy to use. You can paint walls, ceilings, floors, house exteriors, furniture – anything in the photos. I love Benjamin Moore’s paint color software. They offer sample rooms that you can mix and match colors as well as the ability to upload images of your room(s). Yes, it’s free (but you do need sign up). It’s super easy to do. Once you have your image uploaded (you’ll need an image at least 1,200 px x 1,200 px), you can create up to 5 zones on which you’d like to add colors. The software offers several ways to apply colors. There’s a paint brush, magic wand and shape tool. The colors are then easily inserted into the zones you choose. This will give you a great idea what different colors will look like in your room. 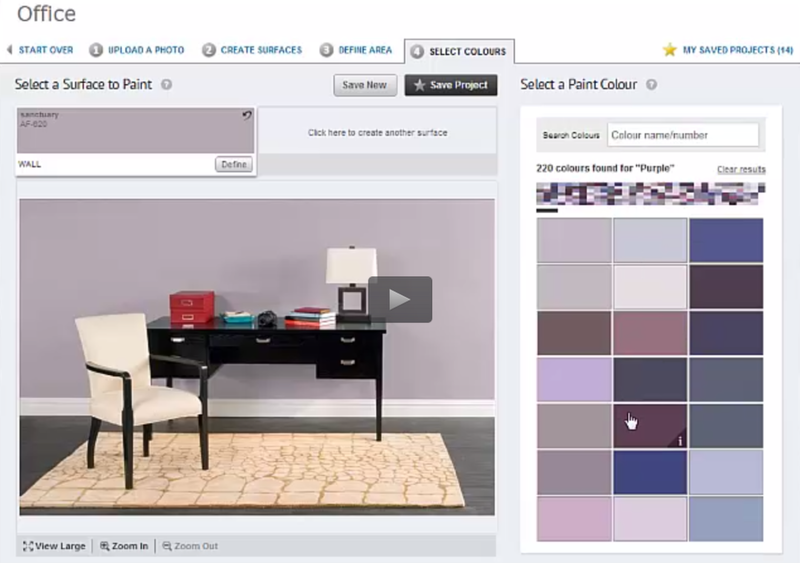 Click here to use Benjamin Moore’s “Paint Your Room” software. What I really like about Sherwin-Williams paint selector software is it makes color theme suggestions. This is very helpful when starting out. After all, there are millions of color combinations so getting started isn’t easy. Within the scenes offered by the software, you can add your own colors to preset zones to see how they look together. You can also upload your own images. Within this screen you can select zones with a paint brush, magic wand or zone selector. The software includes access to a wide array of color collections which shows you beautifully painted rooms and sets out the paint colors provided. You can also check out several expert color theme picks. To recap, Sherwin-Williams ColorSnap ® Visualizer for the Web offers pretty much everything you could want to help you choose the right paint colors for your room(s). I particularly like the expert picks option that’s perfect as a starting point. Click here for the Sherwin-Williams ColorSnap® Visualizer. 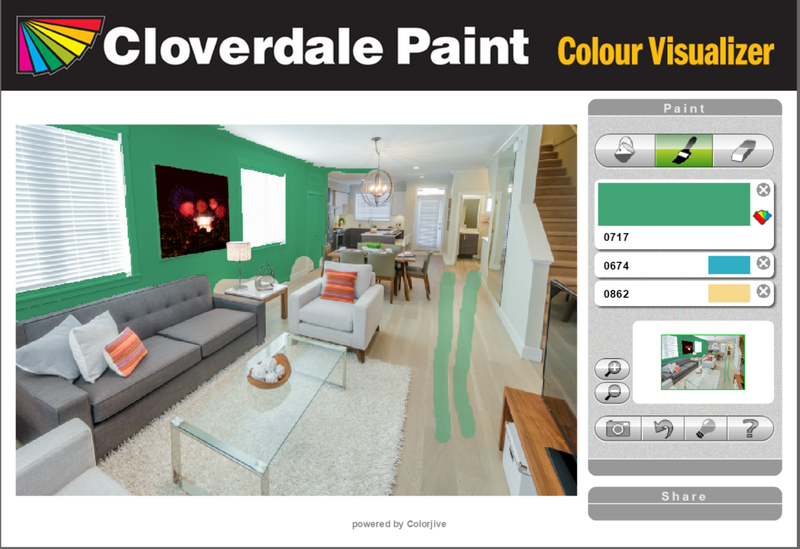 While easy to use, Cloverdale Paint Colour Visualizer lacks in finesse for choosing paint zones on your uploaded images. It only offers a paint bucket and broad paint brush for selecting zones. This results in a lack of precision in choosing your zones. Moreover, this paint color tool doesn’t offer color themes or starting paint color combinations. That said, it’s super easy to use, isn’t buggy at all and you don’t need to sign up with your personal details. Behr® Paint Colours software starts with color schemes instead of rooms. This is a different take on the above listed paint color software options. What I like about this paint selector software is it make choose different color themes easy. From there, you choose a room and can then implement the various color themes into the room colors. The downside to this software is you cannot upload your own images. At least I didn’t find anyway to do so. A huge advantage to this software is how quickly you can test different colors. It’s very easy to toggle between the color options and the room image. Once the room image is displayed, it’s one click to see the color implemented on the image. While you can’t use your own images, this is very handy to get a general idea of what specific colors will look like in various rooms. In a nutshell, Behr® Paint Colours software is fantastic for choosing paint colors quickly. Rodda Color Visualizer offers the ability to work off of existing images as samples or upload your own images. The biggest benefit of this color interior design software is the ability to input different types of flooring in images. This really completes your interior design color analysis. Like Behr’s® software, the Rodda software is meant to be fast. When working off of the sample images, instead of having to use zone selector tools, you simple click the preset parts of the room on which you’d like to apply colors. For example, you can change the walls, ceiling, baseboards, crown moulding, window trim and/or floor. The sample images cover all main rooms of the home, including bedrooms, bathrooms, kitchens, foyers as well as exteriors. If you wish to upload your own images, you must create an account. It’s free, but you know the drill with creating accounts. Once an account is created, you upload the image and have the option to trace/outline zones or use a fill magic wand (similar to the paint bucket tool). Here’s a screenshot. One really great feature with this tool is you can also input different types of flooring. This is a terrific feature because the floor is a huge component to the interior design of any room. In a nutshell, while the Rodda software isn’t as easy to use as some of the others set out above, it does offer the ability to input different types of flooring. This is a huge benefit… and if new floors are part of your renovation or interior design, give this software a try. This tool is exactly what you need if you want to determine whether a paint color will look good in your room or not. You can upload your own photo but make sure you agree with the terms and conditions first. Otherwise, you can check out the paintable photos available on the website. The home areas that you can readily paint through this tool are bedrooms, nursery, dining rooms, living rooms, and more. Select the part of the house that you want to try coloring and find the colors you want to use. Among the options are colors from Home Depot, Amazon, and Wal-Mart. You can also search the name of the paint color or use a photo to extract the colors from it. Finally, it is time to visualize the room by changing the color based on the hues you have chosen. The tool will help you see if the colors you want to use go well with one another. After you are done, you can save the project, which you can do if you are signed in. If you are happy with the colors you have selected, you can use the app to order the hues online. Click here to try this software. The easy-to-use painting tool lets you find the color that best suits the room in your house for free. Now, you do not have to waste any more paint with this app. Select the photo from your gallery or you can choose from the available ones on the site. Then browse the colors you can use for the paint project. Some palettes are curated and if you cannot find the right hue, you can search for it using its name. The next step is to save all the colors you want to try. Once you have all the hues you like, go to the next procedure which is to paint the room. There is a reset button so you can remove all the changes you have made. Get the summary of the colors you used using the Review tab. Finally, save the project in JPG format which is only possible if you have an account. You can also share it on social media sites. Check out how your room will look in the color you want before you paint it with this color visualizer tool. You can either upload an image or you can get started with the photos from the site. You can choose from the selection of photos, which are from varying categories, namely residential, commercial, and exterior. Once you have picked the room that you want to paint virtually, you can start looking for the colors that catch your eyes. The tool will not only let you choose the hue but will also give you a hint on what colors go well with the one you picked. If you are not happy with the result, just clear the changes you made and begin again. Click here to try McCormick Paints software.